Nagaur in Rajasthan is mentioned in the glorious pages of history. With roots back in the era of Mahabharata, the city has numerous tales to tell. Explore heritage, architecture of splendid monuments and legends of history with a wonderful stay in the heritage hotels in Nagaur. The birthplace of Meera Bai and Abul Fazal has awe-inspiring experiences to offer. The desert city is the abode of the magnificent Nagaur Fort. Temples and mosques dating back to the Mughal Era still stand tall. One of the biggest fair in Rajasthan is held in the town. 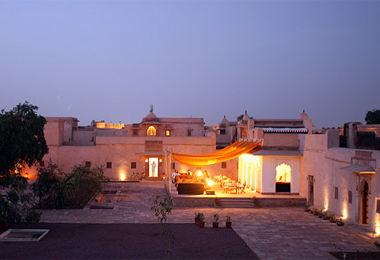 Heritage Hotels in Nagaur is a wonderful way to relish the essence of Rajasthan. The architecture is a mix of Mughal-Rajput style. The ambiance is a reminiscence of royalty. Modern luxuries are offered to guests. Beautifully decorated rooms, en-suite bathrooms, multi-cuisine restaurants, lavish bars, pampering spa, games, lawns, 24 -hour room service, laundry, internet access, medical assistance, banquet and business center are some amenities. Plan a lavish stay in a restored royal home of Nagaur.